As part of a £3bn redevelopment programme in Elephant and Castle, the area is being transformed into an exciting new destination for London over the next 15 years. 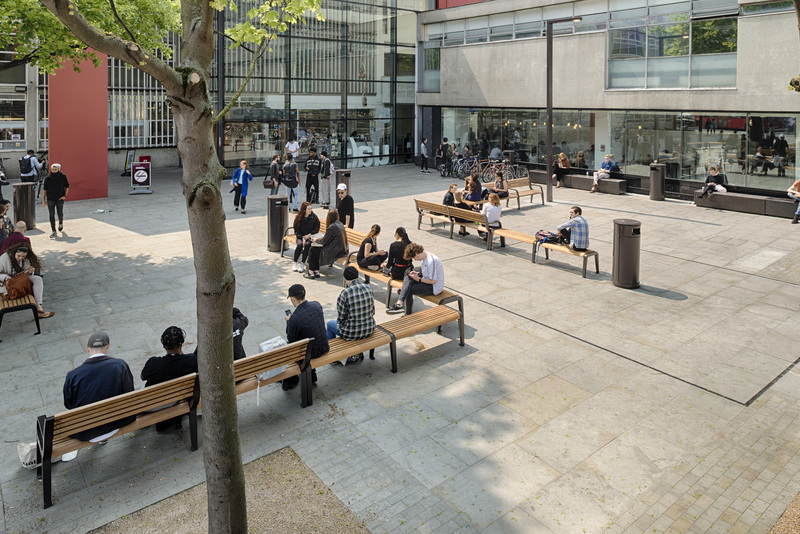 The regeneration includes transforming the wasted space in Elephant and Castle into a usable, thriving public space, including a pedestrianised town centre, market square, and new green spaces. Local people will benefit from the dramatically improved physical environment with tree-lined streets, high quality open spaces and a largely traffic free environment, allowing more space for social seating, pop-up markets and events. 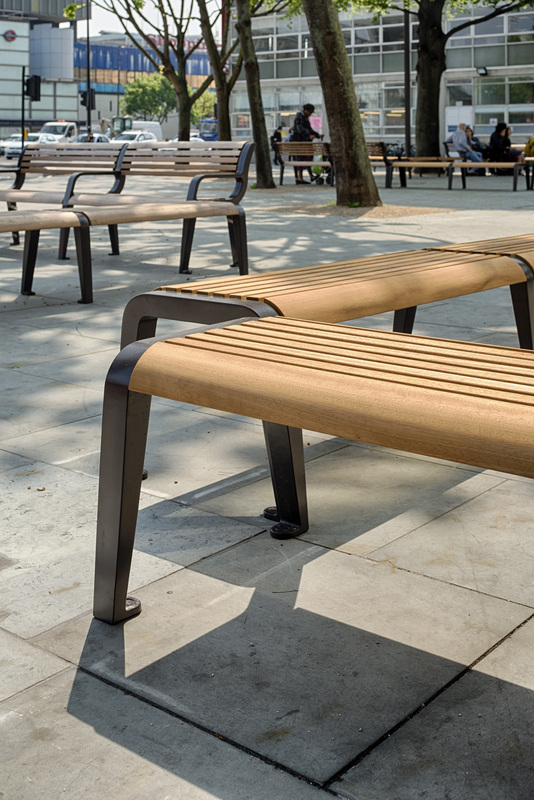 Our bespoke bronze seats in Leicester Square provided the inspiration for this project, and the client wanted to create a similar effect for the seating in Elephant and Castle. Instead of the bronze arms however, the client opted for powder coated cast aluminium. The aluminium was heat treated for additional strength to ensure it stands up to the demands of a bustling public space. In order to satisfy DDA compliance, the design was also adapted to include arm rests. The benches were finished with Iroko timber to contrast with the aluminium legs, which create a modern, contemporary aesthetic. Cast concrete beds were added beneath the paving, and house threaded tubes, which mean the seats could be simply bolted into place for easy installation. This also allows the products to be removed at a later date should any maintenance be required. 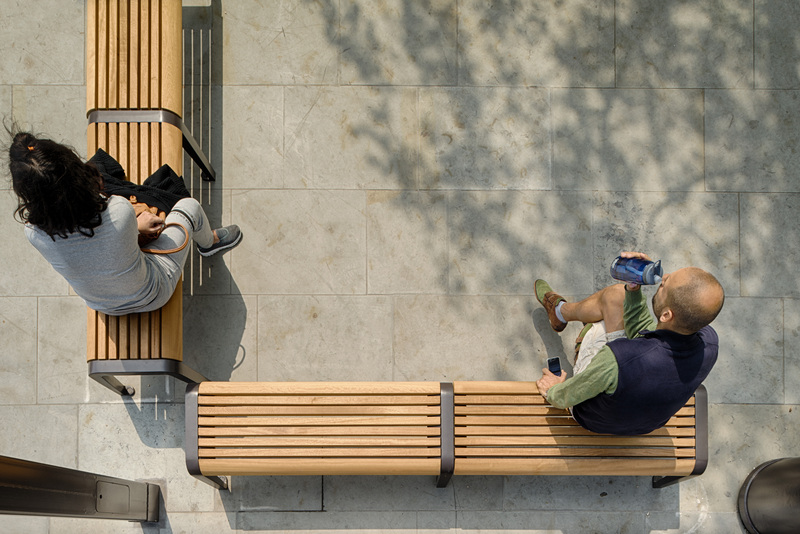 The bespoke seats were designed to encourage sociable, engaging, and inviting areas for residents and visitors alike. 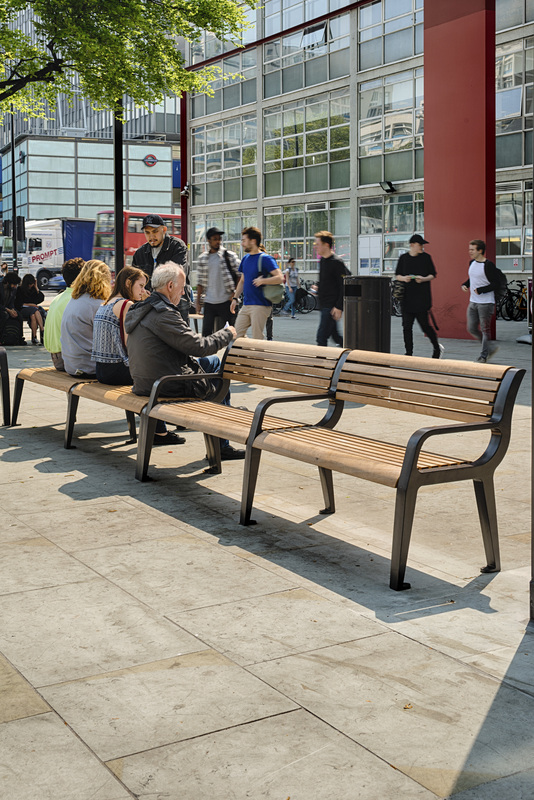 The end result is a series of functional yet attractive seating zones throughout the Elephant and Castle district, which capture the ethos of sociable seating perfectly.